Xiaomi Mi 8 is all set to be launched on May 31, which is just a week away – but the leaks keep on pouring in. The Chinese company is also doing its part in the form of teasers. One of these teasers explains why Xiaomi decided to name the successor its 2017 flagship – Mi 6 – as Mi 8 instead of Mi 7. Another teaser hints that the Mi 8 will come with a novel method of unlocking – whether that will be Face ID-like 3D facial scanning as rumoured to an under-display fingerprint sensor, remains to be seen. The next Xiaomi flagship is also in the rumour mill again, and its key specifications surfaced online. It has additionally been spotted that some Chinese offline stores have listed the handset. There are reports that the company will launch multiple variants of the Mi 6 successor along with different prices. Through a Weibo post, Xiaomi has released an image to answer why it decided to skip the Mi 7 name altogether to bring the Mi 8. 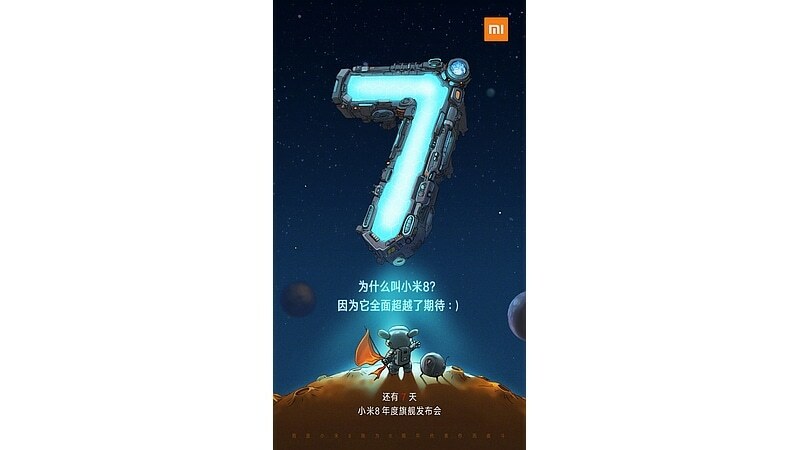 The image shows a huge number seven and says since the Mi 8 exceeds expectations in all aspects, Xiaomi has decided to call its next flagship the Mi 8, instead of the Mi 7, as spotted by folks at Playfuldroid. This highlights that the there is no existence of the Mi 7, and the Mi 8 will be the only next flagship by the Beijing-based company. Furthermore, the Mi 8 will be aligned with the eighth anniversary of the company. Next up, is the Xiaomi teaser – once again on Weibo – that hints at a brand new unlocking method of the Mi 8 flagship smartphone. As we mentioned however, the company doesn’t reveal what this method will be. There have been several rumours in the past about a 3D face scanning method being employed, similar to what Apple uses on the iPhone X – Face ID. There have also been rumours of an under-display fingerprint sensor for the Mi 8. Which one will Xiaomi choose? Or will it include both? This will be revealed next week at the launch. Apart from the official words on why Xiaomi didn’t prefer the Mi 7 as its next flagship, specifications of the Mi 8 have reached the Web. A leaked image posted by tech blog Techienize shows that the Xiaomi Mi 8 will feature a 6.2-inch full-HD (1080×2280 pixels) display with an 19:9 aspect ratio. This contradicts the previous reports of the handset sporting a 6.01-inch display. Further, the leaked image mentions that the Xiaomi Mi 8 will come with Android 8.1 Oreo-based MIUI and will be powered by a Qualcomm Snapdragon 845 SoC. It is also said to have a dual rear camera setup with a 20-megapixel primary sensor, featuring an f/1.7 aperture, and a 16-megapixel secondary sensor along with an f/2.0 aperture. On the front, the leaked image shows that there is a 16-megapixel camera sensor along with an f/2.0 aperture. The smartphone also seems to have 6GB of RAM and 128GB of onboard storage. However, some other reports claim that an 8GB RAM variant also exists. It has also been reported that the Mi 8 will pack a 3300mAh battery and will come with 7.8mm of thickness as well as 172 grams of weight. Xiaomi may use a glass back panel to enable wireless charging support. Coming to the availability of the Xiaomi Mi 8. While Xiaomi hasn’t revealed any formal details, folks at IThome have spotted that some Chinese offline stores have started displaying a Mi 8 availability note. The note says that the handset will be available for pre-orders in the country starting May 31 with a price tag of CNY 2,999 (approximately Rs. 32,000). GizmoChina reports that the note is likely to detail the price of the 6GB RAM variant, while the 8GB RAM variant of the Mi 8 that will come with 128GB of onboard storage already leaked with a price tag of CNY 3,199 (approximately Rs. 34,200). If we believe some previous reports, the Xiaomi Mi 8 will come with a notch design and have a 3D facial sensing module to enable a Face Unlock feature in line with Apple’s Face ID. The handset is also expected to come with MIUI 10 out of the box and feature an under display fingerprint sensor.